Aesthetics are a very subjective thing, but I have to admit I'm not hugely infatuated with the look of the Shinobi XL. It's true that black goes with everything, and there's nothing terribly wrong with a good black monolithic tower. My problem is that the way the original Shinobi styling has scaled up leaves me wanting. Try to imagine how the original Unreal Tournament looked back when it came out when we were all running it at 640x480 (or 320x200 in my case; my computer was terrible), then think about how it looks running on a modern system at 1920x1200. The detail doesn't scale up well, and there's a lot of empty space. I feel like that's what's going on here. The shell of the Shinobi XL consists of black, soft-touch plastic and black steel. I'm very fond of the plastic, as it usually feels fairly sturdy and the texture feels classy at almost any point on the price continuum. The front maintains the parallel ventilation lines and features five 5.25" bays. Yet while these ventilation points felt adequate on the original Shinobi, on the Shinobi XL they seem too thin and I'm concerned that they don't draw in enough air on their own. When we move to the top of the Shinobi XL, we find the I/O cluster with an impressive four USB 3.0 ports, a single USB charging port (no data, only power), and the standard mic and headphone jacks alongside the power and reset buttons. Beyond that is pretty much a front-to-back ventilated grate capable of supporting a whopping two 230mm fans or three 120mm fans. 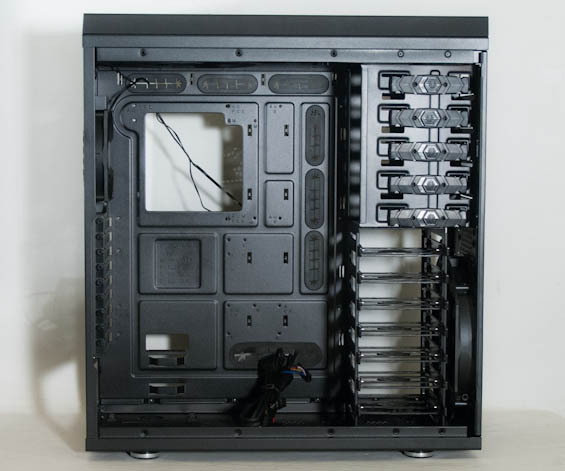 The left side panel features an acrylic window designed to highlight the primary motherboard area, while the right side panel is a basic flat black panel. The rear of the enclosure is also matte black steel, and in fact even the bottom is painted black. When you do look at the rear, though, you can get a feel for just how much space is hidden behind the motherboard tray. The Shinobi XL is as wide as it is for a reason. Four thumbscrews hold the side panels on, and when you remove them you'll find an interior that's largely bog standard for current generation enclosures: bottom-mounted PSU, optical drive bays with toolless clamps, removable hard drive cage oriented laterally with plastic drive trays, and a motherboard tray with rubber-grommet-lined routing holes. Users expecting the kind of creativity we've seen on enclosures like the Outlaw and Prodigy are bound to be disappointed; the Shinobi XL is as fundamental as it gets. That adherence to the fundamentals works fine in the regular Shinobi at half the price, but when you go north of about $120 to $140, you start to expect a little more verve in enclosure designs. While BitFenix excels in making the Shinobi XL water-cooling friendly (how many vendors do you know who find ways to fit three 120mm intake fans in the front of the case? ), the overall design is incredibly tame. That's a shame, too, because modern conventions are far from perfect and there's a lot of room for improvement.